Polls show Harper and His Team Headed in the Right Direction:Up! A Picture Is Worth a 1,000 Words? You can say what you want about Stephen Harper and his Conservative team but after all the Omnibus bills and what have you they are headed in the right direction. That would be up, up by 1 % in the most recent poll. This poll was also conducted after the first round of negative Tommy advertising put out by the Conservatives. There will be all sorts of crying that the poll is not legitimate( There always is) or that it is too far from the next election to matter, but this poll confirms one thing. It confirms what the media has been saying since the last election and it’s why the poll hasn’t been discussed that much today. It’s this: The MSM Pundits have been predicting that the Liberals ( Marijuana Bob,Justin and Crew) are splitting the socialist vote with Tommy( gotta love the Carbon Tax) Mulcair. The MSM hates it when they are right and the Prime Minister and the Conservatives come out on top. It’s a good warning for the two opposition parties. They have a little over two years to get their act TOGETHER or risk being steam rolled. Personally I don’t think any merger will happen until after the 2015 election. The Liberals and the NDP are made up of some pretty strong-willed members( especially the NDP) and they will sit tight and see what happens. Contrary to an earlier poll I think Justin will have to spend at least one term in opposition where at leat he will be able to negotiate any merger or whatever from a position of strength. What do you thinkwill happen on the way to Election 2015? 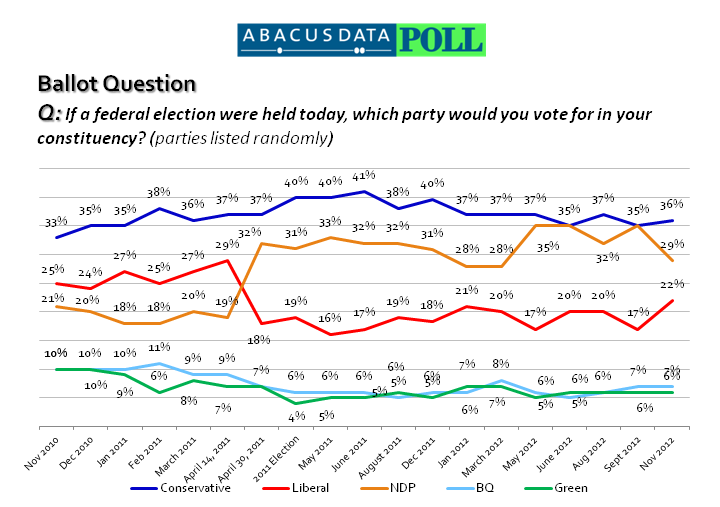 Posted on November 13, 2012 Categories Canadian politics, nationalTags Abacus Data, Conservative Party of Canada, CPC, justin trudeau, Liberal, NDP, poll, Stephen Harper, Tom Mulcair9 Comments on Polls show Harper and His Team Headed in the Right Direction:Up! Pauline Marois: Election Campaigns are no place for platforms! Tommy Mulcair: I will save the day; next time. Sounding a bit like Kim Campbell, Pauline Marois refuses to divulge anything about her party’s platform until at least the leaders debate. She is taking her lead in the polls and the voters for granted and not saying anything that might trip her up except: She is telling anybody who will listen that she has had a transition team in place for a few weeks. She and her party have gone on record today saying they don’t care what the courts say, their religion plan is a go! Why would anybody in their right mind vote for them? Posted on August 17, 2012 Categories Canadian politics, national, provincialTags Pauline Marois, PQ, Tom Mulcair2 Comments on Pauline Marois: Election Campaigns are no place for platforms! Two Faced Marois drops Red Square as National Unity debate rears it’s Ugly Head! Raise your hand if you are in the mood for another round of National Unity BS. With the recent by-election win by the PQ that kinda of talk is once again in the air. In her usual I will do what ever it takes to create the winning conditions for a referendum pose, PQ Leader Pauline Marios has ceased wearing the red square she had on during the height of the student protests. She says she took it off for St.Jean Baptiste day, I say with a potential election on the horizon, her handlers told her that the voters would think her an idiot for continuing to support the union backed student demonstrations and riots. Can Quebec and Canada afford to get into this divisive issue a this point in out history? Canada’s economy is fragile enough without the voters in Quebec handing Marois and her group of treasonous MNAs a reason to have a costly referendum which will no doubt cause markets to rattle and tank worse than they already are. To show the seriousness of the situation, Prime Minister Harper went to visit former PM Brian Mulroney and current Premier of Quebec Jean Charest just to get their point of view on how to handle this potential crisis. I wonder if he asked Charest how he got us into this mess? Tonight PM Harper will follow-up those meetings with a speech targeted at revitalizing the party in the province and yes lay the foundation for a Quebec appeal. Harper’s team also says they will work with whoever wins the election even if it’s the PQ. Of course Tommy Mulcair says this is too little to late. One can only imagine the state of unity if Mulcair and the dippers were in charge of the file. They would give Quebec whatever is left of the Canadian farm while taxing the rest of us to pay for it. Do you think Quebec will plunge us into a national unity debate with the world economy teetering on the brink? Posted on June 24, 2012 Categories Canadian politics, nationalTags Jean Charest, National Unity Debate, Pauline Marois, Quebec politics, Stephen Harper, Tom Mulcair4 Comments on Two Faced Marois drops Red Square as National Unity debate rears it’s Ugly Head!